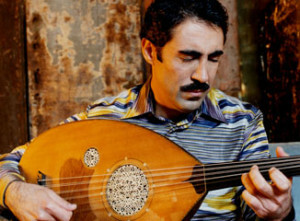 Shaheen is one of the most significant Arab musicians, performers, and composers of his generation. His work incorporates and reflects a legacy of Arabic music, while it forges ahead to new frontiers, embracing many different styles in the process. This unique contribution to the world of arts was recognized in 1994 when Shaheen was honored with the prestigious National Heritage Award at the White House. Recently, Shaheen toured with his project, “Aswat,” in the USA performing in twelve top concert halls. The tour included four leading traditional singers from the Arab World as well as an ensemble of twenty musicians. “Aswat” reflected on film music from the first half of the 20th century particularly in Egypt and Lebanon. He also has been touring performing his oud concerto, which was commissioned by the Detroit Symphony Orchestra and premiered in Detroit in October of 2008. In the 1990s he released four albums of his own: Saltanah (Water Lily Acoustics), Turath (CMP), Taqasim (Lyrichord), and Simon Shaheen: The Music of Mohamed Abdel Wahab (Axiom), while also contributing cuts to producer Bill Laswell’s fusion collective, Hallucination Engine (Island). He has contributed selections to soundtracks for The Sheltering Sky and Malcolm X, among others, and has composed the entire soundtrack for the United Nations?sponsored documentary, For Everyone Everywhere. Broadcast globally in December 1998, this film celebrated the 50th anniversary of the United Nations Human Rights Charter. After graduating from the Academy of Music in Jerusalem in 1978, Shaheen was appointed its instructor of Arab music, performance, and theory. Two years later he moved to New York City to complete his graduate studies in performance at the Manhattan School of Music, and later in performance and music education at Columbia University. In 1982, Shaheen formed the Near Eastern Music Ensemble in New York, establishing a group that would perform the highest standard of traditional Arab music. This time also marked the beginning of Shaheen’s workshops and lecture/demonstrations in schools, colleges, and universities to educate the younger generation. As a champion and guardian of Arab music, Shaheen still devotes almost fifty percent of his time to working with schools and universities, including Julliard, Columbia, Cornell, Princeton, Brown, Harvard, Yale, University of California in San Diego, University of Michigan in Ann Arbor and many others. His concert credits are a veritable compendium of the world’s greatest venues: Carnegie Hall, Kennedy Center, Cairo’s Opera House, Theatre de la Ville in Beirut, and Belgium’s Le Palais des Arts. In May of 2004, Shaheen appeared at Quincy Jones’ “We Are The Future,” fundraising concert in Rome in front of a half million strong crowd. As a composer, Shaheen has received grants from the National Endowment for the Arts, the New York State Council on the Arts, Meet the Composer, New York State Music Fund, the Jerome Foundation, Continental Harmony, and Yellow Springs Institute. In addition to his recorded work, his theatrical repertoire includes Majnun Layla, (performances included the Kennedy Center in Washington DC, and The Museum of Natural History in New York), The Book and the Stranger (from Kalilah Wa-Dimanah), Possible City, and Collateral Damage with actress Vanessa Redgrave. He has also written the music for the documentary of the British Museum’s Egyptian collection, which has toured U.S. museums. Currently, Mr. Shaheen has finished a theatrical production based on the historic epic of Gilgamesh. Since 1994, Shaheen has produced the Annual Arab Festival of Arts, called “Mahrajan al-Fan.” Held in New York, the festival showcases the work of the finest Arab artists, while presenting the scope, depth and quality of Arab culture. To continue this exposure to Arab music and culture, Shaheen founded the Annual Arabic Music Retreat in 1997. Held each summer at Mount Holyoke College, this weeklong intensive program of Arabic music studies draws participants from the U.S. and abroad. In Palestine, Shaheen conducts an annual weeklong music workshop designed for gifted children. For the past six years, though, Shaheen has focused much of his energies on Qantara. The band, whose name means arch in Arabic, brings to life Shaheen’s vision for the unbridled fusion of Arab, jazz, Western classical, and Latin American music, a perfect alchemy for music to transcend the boundaries of genre and geography. The band has toured during 2003 – 2005, playing concerts and festivals like WOMAD USA, WOMAD Sicily, the prestigious Newport Jazz Festival, Montreal Jazz Festival. Traveling throughout Europe and the Middle East, Qantara’s appearances have included: Beiteddine Festival in Lebanon; Les Mediterranean in France; New York’s Central Park Summer Stage; Stern Grove International Festival in San Francisco; Chicago World Music Festival; Royce Hall in Los Angeles; University Musical Society in Ann Arbor; Walker Arts Center in Minneapolis; International Souk Ukaz at the historic citadel in Amman, Jordan amongst others. In addition to performing with his two bands, Qantara and the Near Eastern Music Ensemble, Shaheen tours as a solo artist internationally and as a lecturer throughout the academic world promoting awareness to Arab music through numerous lecture and workshop presentations.